1. I’m a sibling who would love to connect with fellow S.I.B.S., but I’m not sure how to get involved. Where should I start? Welcome – we’re so glad you asked! First, be sure to sign up for our email list and receive your free copy of Stronger Together, our digital resource guide created especially for Illinois siblings. Next, join the S.I.B.S. Network Facebook Group to connect with fellow siblings and hear about the latest events, advocacy opportunities, and more. You can also download our print brochure if you’d like. While you’re at it, bookmark our Home or Events page and see what’s happening in your area. 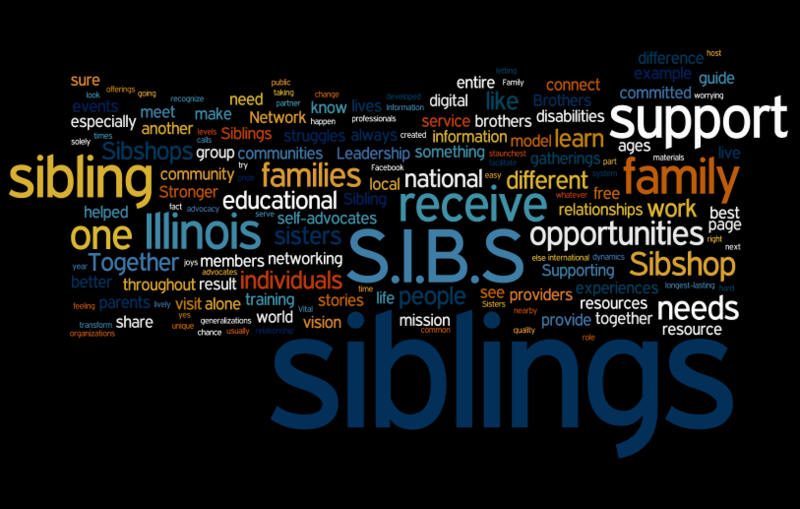 (You can also download our full list of Sibshops and Sibling Support opportunities in Illinois here.) Make in-person connections with fellow sibs at local conferences, holiday parties, and friendly gatherings. We love to support restaurants and businesses that employ people with disabilities, and we welcome your suggestions! 2. I’m a parent of children with and without special needs. How can I best support my children? Convey unconditional love and support, along with clear expectations. This is vital, as some typically-developing brothers and sisters react to their siblings’ disability by setting unrealistically high expectations for themselves, ‘compensating’ for their siblings’ special needs. To the extent possible, have the same expectations for the child with special needs regarding chores and personal responsibility as for typically-developing children. Similar expectations foster independence and minimize the resentment expressed by siblings when they encounter two different sets of rules – one for them, and another for their sibs who have special needs. Empower children with special needs, helping them to acquire skills that will allow them to be as independent as possible as adults. When this occurs, the entire family benefits. Keep a healthy perspective. A parent’s interpretation of their child’s disability has a greater influence on the adaptation of their typically-developing sibling than does the actual disability itself. Acknowledge siblings’ concerns. Brothers and sisters experience a wide array of oft-ambivalent emotions regarding the impact of their siblings’ special needs. These feelings should be both expected and acknowledged by parents and other family members. Because most siblings will have the longest-lasting relationship with the family member who has a disability, these concerns will change over time. Encourage open communication. Books such as How to Talk So Kids Will Listen and Listen So Kids Will Talk and Siblings Without Rivalry (both by Adele Faber and Elaine Mazlich) provide helpful tips on communicating with children. Such messages evoke feelings of guilt in the typically-developing sibling. Typically-developing siblings may be mature beyond their years, but like any child, they need space to make mistakes. Siblings sometimes misbehave, get angry, and fight with their siblings, just like other typically-developing children. Offer one-on-one time. Children need to know that their parents care about them as individuals. When parents carve out time to grab a bite at a local burger joint or window shop at the mall with just one of their children, it provides an excellent opportunity to talk and listen. Provide a safe environment. Some siblings live with brothers and sisters who have challenging behaviors. Other siblings assume responsibilities that go beyond their age level and place all parties in vulnerable situations. Siblings deserve to have their own personal safety given as much importance as the family member who has special needs. Offer opportunities for typically-developing children to meet peers. Brothers and sisters like to know that they are not alone with their joys and concerns. For most parents, the thought of “going it alone” – that is, raising a child with special needs without the benefit of knowing another parent in a similar situation – would be unthinkable. Yet this routinely happens to brothers and sisters. Seek out the help you need. When parents seek support, information, and respite for themselves, they model resilience and healthy attitudes and behaviors for their typically-developing children. Celebrate every child’s achievements and milestones. Families who seek respite resources, strive for flexibility, and seek creative solutions can help assure that the accomplishments of all family members are celebrated. For example, when parents are seemingly unable to leave their child with special needs, they may miss their typically-developing child’s valedictorian speech at high school graduation. One child’s special needs should not overshadow another’s achievements and milestones. For more, download What Siblings Would Like Parents and Service Providers to Know, provided in partnership with the Sibling Support Project. 3. What are some positive actions that experts recommend parents take with their typically-developing children who have a sibling with a disability? Treat the child who does not have a disability as a child, not just as another adult caretaker. Do not demand or expect a child to take on responsibilities for which he or she is unprepared. Remember that children have feelings too. Take time to ask them how they feel about having a sibling with a disability. Encourage them to express their feelings openly. Provide siblings with choices and include them in decision-making. Discuss family matters with your children, especially if it affects them personally. Ask for and value their opinions. Give them information about their brother or sister’s disability. Answer their questions and respond to their concerns in a simple but precise manner. Explore the ways in which family structure affects siblings. Some studies have looked at gender and birth order to see if either one has an affect. In most situations, these factors may make only a slight difference, except in the case of increased caregiving responsibility. Research has shown that older daughters who do not have a disability are typically expected to provide more caregiving to a brother or sister with a disability. (Lobato, 1990). 4. Why is sibling support so important, especially given the fact that many individuals with special needs need more support themselves? Many of these people have typically-developing brothers and sisters. These siblings are too important to ignore, if only for this reason: brothers and sisters will be in the lives of family members with special needs longer than anyone. Brothers and sisters will be there after parents are gone and special education services are a distant memory. If they are provided with support and information, they can help their siblings live dignified lives. 6. I’m a service provider, and I’d like to learn more about how to support siblings of people with disabilities. What would you recommend? Actively reach out to brothers and sisters. Consider inviting (but not requiring) brothers and sisters to attend informational, IEP, ISP, and transition planning meetings, and clinic visits. Siblings frequently have legitimate questions that can be answered by service providers. Brothers and sisters also have informed opinions and perspectives; they can make positive contributions to the team. Include brothers and sisters on advisory boards and in policies regarding families. Reserving board seats for siblings gives your group an important perspective, and reflects your agency’s concern for the well-being of brothers and sisters. Developing policies based on the important roles played by brothers and sisters helps assure them that their concerns and contributions are valued. For a complete list of recommendations, download a Checklist for Agencies and What Siblings Would Like Parents and Service Providers to Know, provided in partnership with the Sibling Support Project. 1. What are the benefits of being the brother or sister of a person with a disability? Researchers have found that children in families where a sibling has a disability can become more mature, responsible, self-confident, independent, and patient. These siblings can also become more altruistic, sensitive to humanitarian efforts, and they often have a greater sense of closeness to family (Lobato, 1990; Powell, 1993). Growing up with a sibling who has a disability may instill a greater level of understanding and development in the siblings who are not disabled. They may develop greater leadership skills, especially in areas where understanding and sensitivity are essential. 2. In what way does having sibling with a disability differ from having a sibling without a disability? The relationship between siblings and their brother or sister with a disability can be identical to the relationship between any brother or sister. They may be close and remain so into adulthood, or they may never develop a close relationship or grow apart as they get older. Family situations and circumstances, such as divorce or cultural differences, also affect the way a sibling relationship develops. Myriad factors affect how siblings relate to each other, not just the fact that one of them has a disability. However, sometimes having a brother or sister with a disability in the family creates challenges that other families may not experience, and these challenges affect siblings. 3. What are some of the concerns of siblings of people with disabilities? Guilt about not having a disability. Some siblings may feel they are to blame for their brother’s or sister’s disability. Embarrassment of the sibling’s behavior or appearance. The sibling who does not have a disability may avoid contact with the brother or sister, or not invite friends to the home. Fear that they might develop the disability. Children (or even adults) may think that disabilities such as mental retardation are contagious. Anger or jealousy over the amount of attention the brother or sister with a disability receives, especially if the child’s disability requires additional care. Isolation; a sense that no one else has the same feelings about having a sibling with a disability. Pressure to achieve in order to “make up for” a brother or sister’s inabilities. The sibling who does not have a disability may feel that excelling in school, sports or other ways will compensate for what their brother or sister is unable to do. Caregiving, especially if it conflicts with plans with friends or becomes overly burdensome. Information needed about a brother or sister’s disability. Siblings often are not given thorough information about why a sibling has a disability, how it affects him or her, and what the family can do to help this family member. For example, siblings who do not have a disability may be concerned about the future of their sibling with a disability after the parents die, especially if this brother or sister still lives at home. Special thanks to Donald J. Meyer, Director of The Sibling Support Project, A Kindering Center program, Seattle, Washington, for his assistance in preparing this Q&A. The Sibling Support Project provides national training and technical assistance on starting Sibshops, lively peer support programs for school age brothers and sisters and maintains a directory of sibling programs. The Sibling Support Project also hosts SibKids and SibNet, no-cost listservs for young and adult siblings of people with special needs. Author, Family Support Bulletin. “Tips for Dealing with ‘Siblings’ of Persons with Disabilities.” Spring/Summer 1988. Washington, D.C.: United Cerebral Palsy Associations. Itzkowitz, J., Springboard. “Fostering Supportive Relationships: Remember the Siblings.” Vol. 1, No. 2, Fall 1991. Minneapolis: The Center for Children with Chronic Illness and Disability. Lobato, D.J. (1990). “Brothers, Sisters, and Special Needs: Information and Activities for Helping Young Siblings of Children with Chronic Illnesses and Developmental Disabilities.” Baltimore: Paul H. Brookes Publishing Co., Inc.
Meyer, D.J. & Vadasy, P.F. (1994). “Sibshops: Workshops for Brothers and Sisters of Children with Special Needs. Baltimore: Paul H. Brookes Publishing Co., Inc.
Powell, T.H. & Gallagher, P.A. (1993). “Brothers and Sisters: A Special Part of Exceptional Families.” Baltimore: Paul H. Brookes Publishing Co., Inc.